Autori : Brunhilde Pomsel Hansen Thore D.
The last witness of the Reich recounts his years next to Goebbels | Brunhilde Pomsel was close like few others of his contemporaries to one of the biggest criminals in history: Joseph Goebbels, Hitler's Propaganda Minister. Always at his side, always under his orders as a Secretary and stenographer. Brunhilde not interested in politics. For you were before the work, material security, a sense of duty towards their superiors, the need to feel part of a system. Shortly after the rise of Adolf Hitler, he joined the National Socialist Party to secure a place on the radio. In 1942 he moved to the Ministry for public education and Propaganda to find herself so next to the Office of Goebbels and the nerve center of Nazi power. Stays there till the capitulation in May 1945. During the last days of the war, when the Soviet troops are already in Berlin, rather than take the opportunity to flee remains in the bunker typing press. Then, for seventy years, do not tell anybody anything. From the heart of Berlin, the author paints a portrait unconscious, yet super creepy, Germany before, during and after the Reich, telling a staggering reality that shows how much indifference and disenchantment could affect democracy. "Before history repeats itself" says Thore d. Hansen "spot the similarities between past and present you offers us the opportunity to carefully calibrate our moral compass, so as to realize when it is time to stand, to stand up and oppose openly to radicalisation. How superficial we consider our moral standards? For what purposes, immediate, mundane and superficial primitive or apparent successes for which we are ready to sacrifice our conscience? Are the questions that the story of Brunhilde Pomsel cannot and will never give an answer universally valid. Only the willingness to think of each one of us can make it "
Promozione Il libro "Una vita tedesca" su Unilibro.it è nell'offerta di libri scontati Scopri tutte le novità appena arrivate #inLibreria! 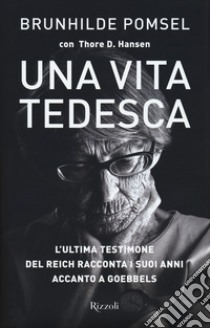 Recensioni Scrivi la tua recensione del libro "Una vita tedesca"